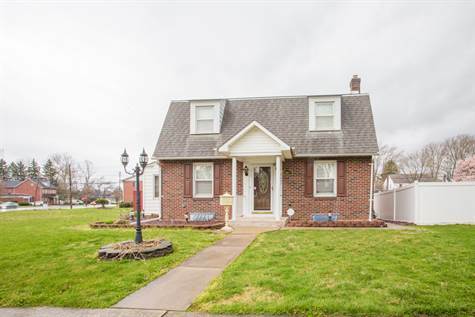 Extremely well maintained brick Cape Cod style dwelling in a desirable Bethlehem location. Good sized rooms, plaster walls, hardwood and tile floors show the quality construction. First floor office, modern kitchen and a spacious finished family Rm with full bath in the lower level. Economical gas heat, hot water and range. Central air to keep you cool. Huge covered patio and deck overlook the fenced rear yard which provides access to the over-sized 3 car garage with plenty of extra storage. Ideal for the auto enthusiast, contractor or person with lots of toys! Too many quality features to mention. You'll have to see for yourself. Hookup for generator backup in garage powers house during power outages. Generator has been removed.